Patrick Tiernan was 16 years old when he arrived in Lowell from Longford, Ireland, in the mid-19th century. He ventured out to celebrate his first Fourth of July, and was hit in the face by a canon blast. He died soon after from his injuries, and the story of his brief life is etched on a gravestone, cracked and crumbling, in a Catholic cemetery in Lowell. ''I wish we had gotten to that one sooner," David Duncan MacKean said last Saturday morning, as he wandered through St. Patrick's Cemetery, where Tiernan is buried. In recent years, MacKean has restored 750 gravestones of Lowell's early Irish immigrants. ''These stones have a wealth of stories," said MacKean, who teaches fifth grade in Nashua and spends his spare time at St. Patrick's. While MacKean focuses on restoring old graves, others are trying to locate people in unmarked ones. Donna Reidy said she hopes that by placing markers on those plots, her group may honor Lowell's early Irish immigrants and their important role in building the city. ''There and there," said Reidy, a member of Lowell's chapter of the Ladies Ancient Order of Hibernians, a charitable group that supports Irish and Irish-American causes, pointing out a few unmarked spots of ground where people are buried in the densely populated graveyard off Gorham Street. ''I'm just trying to honor these people who did so much, and had so little . . . They contributed a lot to Lowell. They deserve a marker," she said. In the past two years, she been able to raise enough money from private donors to pay for six markers inscribed with 45 names. Since MacKean's Irish ancestors arrived in Lowell in the 1880s, each generation has been affiliated in some way with St. Patrick's Church in Lowell's Acre. His fascination with history led him from the city's first Catholic church to its first Catholic cemetery. ''I always say history is a verb and every grave is a story," he said. As he wandered past crumbling slate gravestones and over piles of windswept leaves, he talked about the rich Bostonians who built Lowell, an industrial city on the banks of the Merrimack River. After buying up swatches of land from Chelmsford farmers, the Boston Associates -- as the capitalists were known -- needed laborers to dig the canals, which would harness the river water, and build the mills, where the manufacturing work began. They hired a charismatic Irish immigrant named Hugh Cummiskey, who recruited 30 Irish laborers. In 1822, they walked from Charlestown to the city-in-waiting. MacKean said that the mill owners wanted the Irish to do the work, and then move somewhere else. But after the workers settled into what was known as Paddy Camp, their wives and children followed. In 1827, there were 52 Irish Catholics living in Lowell. By 1831, there were 400, according to MacKean's data. That same year they established St. Patrick's Church, and began living around it, in what is known today as The Acre. Life was hard, and people died young. When the closest Catholic cemetery, St. Augustine's in South Boston, filled up, the Lowell Irish established their own burial ground, next to a Protestant burial ground. They called it the Catholic Burial Ground, and had it consecrated in 1832. The first gravestone placed there belonged to John Bork, who died at age 2 years and 11 months on March 9, 1832. His tiny slate stone is the oldest in the cemetery. Because at that time, a gravestone cost $3 -- a laborer's weekly wage -- not every one could afford one. Even Cummiskey, who died in 1871 at age 82, didn't have one, until recently. The few Catholics who could afford gravestones bought them from Yankee stone carvers, during a time when Catholics and immigrants were often treated with suspicion and scorn. The fashion of that time was to decorate the slate stones with a weeping willow -- the traditional sign of mourning -- and a Grecian urn, but the Irish requested shamrocks on theirs. ''The Yankee carvers had no idea what a shamrock looked like," MacKean explained. '' 'What is a shamrock?' I can imagine those Yankee stonecutters asking, and the Irish would say, 'Well, it has three sides,' " said MacKean. As a result, the shamrocks on the old gravestones don't look alike, or much like shamrocks. ''They are all unique," MacKean said. He also doesn't know why the Irish insisted on having them. ''It could be a sign of the Trinity, or a sign of identity, as though they are saying, 'We are here to stay'," he said. 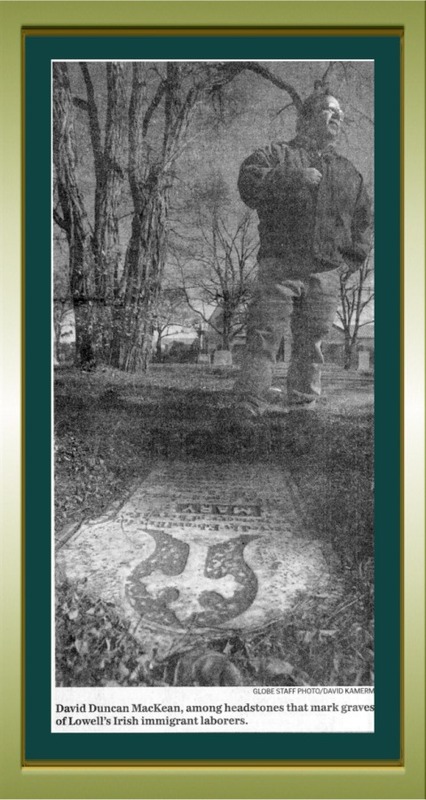 As MacKean was working in the cemetery a few years ago, restoring graves that had been buried by grass, he met Reidy, searching for ones that were missing. Reidy had visited Ireland, where she met a restaurant owner. ''When I told her I was from Lowell, she said that some of her ancestors, the Hussey family, had gone there," Reidy said. ''So I said, 'Let me find out where they are buried, and get a picture of their gravestone.' 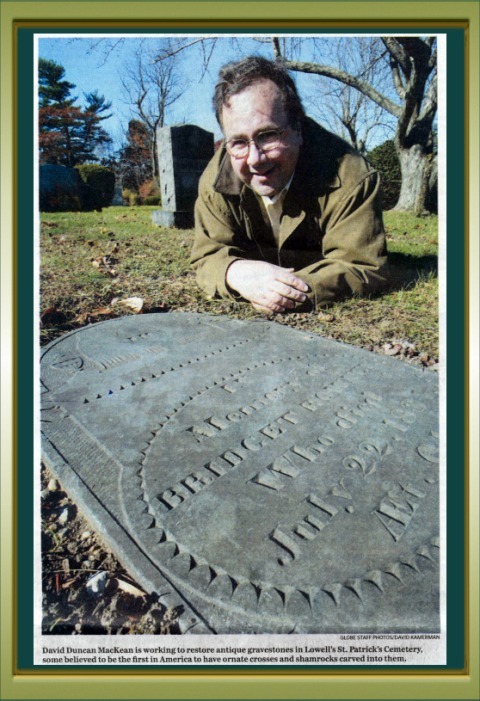 "
When she returned to Lowell, Reidy went to St. Patrick's and researched the cemetery records. The Hussey family was buried there, the records showed. But when Reidy couldn't find the family plot, she discovered that many of the early Irish immigrants didn't have marked graves. ''They lived in poverty. They didn't have enough to put a stone over their heads, and after the life they struggled through, they deserve a marked grave," she said. ''Here we are enjoying the fruits of their labor. It's payback time," she said. 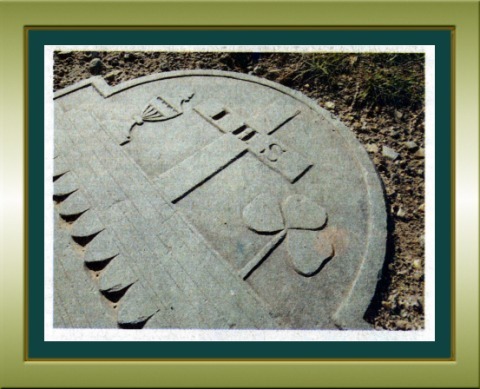 With help from the Hibernians, Reidy and MacKean formed a group called Friends of St. Patrick Cemetery Association. One of the next things the group plans to do is restore Patrick Tiernan's grave, to prevent it from crumbling even more. ''When you find a grave, it's just a grave," MacKean said. ''But when you get a name, it's a story, and a person with a past."